The majority of Charlie's modification work went on under the hood. 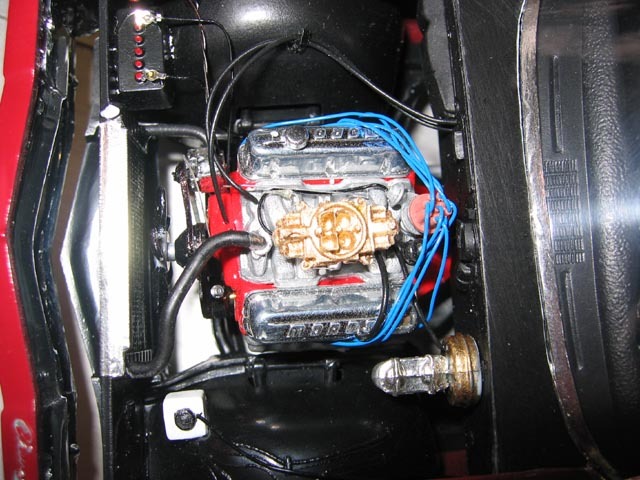 The engine modifications include relocating the alternator to the correct side of the engine and adding a power steering pump, MOROSO valve covers, a Holley four-barrel carb, and a Replicas and Miniatures Company of Maryland distributor. Around the engine, he filled the gap at the top edge of the firewall, Adapted the master cylinder from the Olds 442 kit and represented the sound insulation with flocking on the under side of the hood.